Well, week 9 had a lot of blowouts, including my game that I lost by about 50 FP. 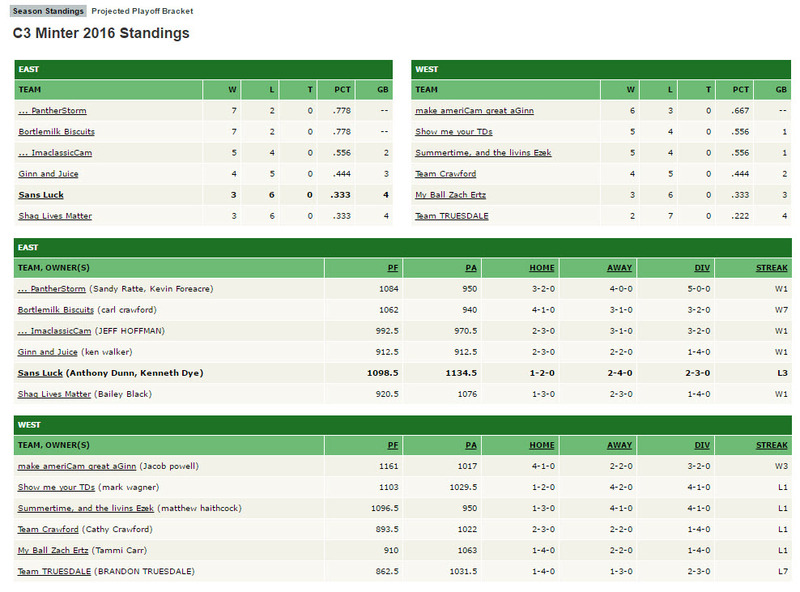 I've pretty much given up on this, since I STILL have out-scored everyone in my division, yet, I'm tied for last at 3-6. Kinda shows me the futility of playing head-to-head FF, since I have absolutely zero control over "fantasy points allowed," which is even higher than those that I've scored. It's pretty pointless. Here was a very close game where Shaq Lives Matter defeated Team Truesdale, 100-96. Both teams had guys put up some stinkers, but Shaq was able to overcome it to win. Their Ball Zach Ertz must really be aching after this loss. After his team had Marcus Mariota score 26 FP, ImaClassicCam scored 26 FP last night with Russell Wilson to help provide the margin of victory, winning 112-107. For ImaClassicCam, DeMarco Murray once again pulled through with a solid performance with 18.5 FP, but TE Jason Witten had a monster day, especially for a TE whose name doesn't rhyme with Pronk, posting 24 FP. My Ball Zach Ertz managed decent days from everyone other than Murray's back-up, Derrick Henry, who laid an egg, and the erratic Kenny Stills with 1.5 FP. I would have beaten all but four opponents, scoring 104.5 FP with Lamar Miller & Dustin Hopkins on byes, but the Fantasy Football gods have NOT been smiling upon me this year. Oh well...it's only a game!